From now until January 2013 Ancestry (www.ancestry.co.uk) will be digitising various record sets from Surrey History Centre in Woking. This will mean that some collections may not be available for consultation if you plan to visit, so best to check in advance. Visitors to Carrickfergus Castle in County Antrim will be able to hear wartime tales and stories from the two world wars throughout August. A variety of characters from the British and US ‘armies’ will display equipment and vehicles, as well as recall stories, on each Sunday throughout the month from 10.30am to 5pm. The full story is in the Carrick Times at www.carrickfergustimes.co.uk/lifestyle/entertainment/war-theme-at-carrick-castle-1-4093367. London & Middlesex Will Abstracts 1700-1704 on the National Wills Index! Peculiar Court of the Dean and Chapter of St Paul's Cathedral. The abstracts contain a complete summary of all details appearing in the original will, including names and places (testators, executors, witnesses and beneficiaries) plus relationships, occupations, date of death / burial place and value of estate where found in the original documents. In addition 31 inventories have been listed in detail. There's also a London 2012 Olympics Offer, with 20% off all subscriptions from 27 July - 12 August. To take advantage of the offer, enter Promotional Code: LONDON2012 on the Sign Up or Checkout pages after you have chosen your subscription. The National Archives in England has placed an updated action plan online for its leadership role over the English archive sector over the next three years - it can be read at http://nationalarchives.gov.uk/documents/archives/archives21centuryrefreshed-final.pdf. There's a lot of corporate speak, but it includes some interesting details to genealogists such as plans to initiate cataloguing work within the next 5 years on every outstanding county still to be dealt with in the Manorial Documents Register, as well as information on Network Rail's new archive, developments at Manchester's archives and more. A somewhat Janet and John blog post describing the updated plan is also available online at http://blog.nationalarchives.gov.uk/blog/updated-action-plan-for-archives/ which concludes with the phrase "So, you see, archives are kind of important, and we would really love them to be around for many generations to come". The Chartered Institute of Library & Information Professionals (CILIP) recently estimated that 2,159 posts in the library service would be lost in England, Wales and Northern Ireland from total of 20,924 staff, a reduction of more than 10 per cent, and said 3,000 opening hours were being cut a week. It forecast deeper cuts in 2013. If you're planning on dropping off any old books to a local charity shop, it might be worth holding onto them for a few more months - you may very well end up being the town library. The UK television series Who Do You Think You Are returns next months with a new run. This blog has already reported on Annie Lennox and John Bishop taking part (see http://britishgenes.blogspot.co.uk/2012/07/annie-lennox-to-appear-in-wdytya.html and http://britishgenes.blogspot.co.uk/2012/07/john-bishop-in-wdytya.html), but joining the line up are Samantha Womack, Alex Kingston, Celia Imrie, Patrick Stewart, William Roache, Hugh Dennis, John Barnes and Gregg Wallace. Will Patrick Stewart actually turn out to have a mutant X gene? More soon! At the Who Do You Think You Are? Live event in London in February I was interviewed by the Families in British India Society (www.new.fibis.org), better known as FIBIS. The interview has just gone online at www.youtube.com/watch?v=rLtTAAmsyms&feature=youtu.be&a and is presented below. It was recorded by FIBIS webmaster Valmay Young's son James, who is shortly to start a media course at university - good luck James! The printed papers of colonial governments held by the Colonial Office, including government gazettes and sessional papers of colonial assemblies and parliaments, contain a wealth of detail for historians and genealogists. This podcast outlines the content of the printed papers from the first half of the 19th century to the end of empire; a rich but underused resource. The speaker is Dan Gilfoyle, and the talk runs to just under 33 minutes in length. To listen visit http://media.nationalarchives.gov.uk/index.php/colonial-lives-careers-and-policies-researching-printed-papers-of-the-british-colonial-governments/ or download from iTunes. The National Library of Ireland (www.nli.ie) is hosting a mammoth session of daily family history lunchtime talks throughout August, from Wednesday 1st to Wednesday 29th. Topics include basic Irish research, online resources, Irish surnames, the diaspora, genetic genealogy, military resources, Scots-Irish emigration, the National Archives of Ireland and much, much more. For full details of the talks programme please visit www.eneclann.ie/wp-content/uploads/2012/07/list-of-talks.pdf, whilst to find biographies on the speakers please visit www.eneclann.ie/2012/07/summer-lunchtime-series-2012/. The talks are all free by the way! The talks will be held in the Trustees’ Room at 1pm, no booking required, but seats are on a first come, first served basis. The London Family History Centre is the Mormon Church's largest such centre in the UK. I've just been alerted by a Google alert to a link to the FamilySearch website page for the centre at https://familysearch.org/learn/wiki/en/London_Family_History_Centre - it may or may not be a new link or even updated, but may certainly be of interest if you are in London just now for the Olympics. Bear in mind that just now the centre is temporarily based at the National Archives in Kew (www.nationalarchives.gov.uk). Since February's Who Do You Think You Are? Live event in London, a small group of professional genealogists in Scotland has been meeting informally on a monthly basis at various locations across the country, ostensibly to have a gab, and to discuss interesting research developments in our work as well as within the wider industry. Genealogists who have attended meetings since March of what we are now referring to as the Scottish Genealogy Network have included myself, Marie Dougan, Ali MacDonald, Kirsty Wilkinson, Chris Halliday, Tahitia McCabe, Frances Black, Carolyn McNicholl, members of Lanarkshire FHS and others, with meetings so far having taken place in Dundee, Edinburgh, Glasgow, Linlithgow and Stirling. It is important to emphasise that we are not an organisation requiring membership fees etc, but simply a talking shop. Our meetings have largely been pub based on the last Saturday of each month, with the point being to try to create a wider genealogical network within Scotland. We want to create an opportunity for colleagues to meet face to face, to share expertise with each other and also with those from other disciplines that impact on our work - family history societies, universities, archives and more. Through discussion with each other we can learn about key developments that affect the work we do and to identify ways to further our professional development. So far we've all found it to be a huge success and of great benefit, and as such, we're now looking to invite others along to join the party. If you are working professionally within the area of Scottish based family history, we would be delighted to see you - our next meeting will be held in Perth on Saturday August 25th. To give a flavour of proceedings, at yesterday's meeting in Stirling Ali Macdonald explained what the new Geno 2.0 DNA project announced last week is all about, Chris Halliday updated us on a recent case he's been working on involving the Court of the Lord Lyon, I brought along a copy of Bissett-Smith's 1907 guide for Scottish registrars and discussed a 17th century research case from Ayrshire, Kirsty Wilkinson discussed probate research as well as her excellent new poor law records guide, Carolyn McNicholl explained what goes into the Certified Genealogist credential available in the United States, and Frances Black discussed experiences with the University of Strathclyde course. Other topics discussed included the various ways that the UK's various national archives work (or not!) with the private sector, FamilySearch's work just now with some digitisation projects in Scotland - and the opening ceremony of the Olympics! UPDATE: Our visit on Saturday 25th August will now incorporate a quick visit to Perth and Kinross Archives, as well as the Local Studies Department. A huge thanks to Steven Connelly, Jan Merchant, and in particular, Christine Wood, for helping to arrange and accommodate this. The National Archives (www.nationalarchives.gov.uk) in England has released a second tranche of colonial records, covering Basutoland, the Cameroons, Ceylon, Cyprus, Fiji, the Gambia, Gilbert and Ellice Islands, and Gold Coast. The records are sourced from the Foreign and Commonwealth Office, catalogued under FCO141. The news announcement is at http://nationalarchives.gov.uk/news/746.htm, whilst a guide to the new release is available at http://nationalarchives.gov.uk/documents/migratedarchives-2.guidance.pdf. Eddie Connolly's Eddie's Extracts website has been updated at http://freepages.genealogy.rootsweb.ancestry.com/~econnolly/ with additions of BMD intimations and other clippings sourced from the Lisburn Standard from July 1918. There are also additions to the Soldiers Died in the Great War 1914-1919 collection for members of the Royal Irish Rifles. The latest newsletter from TheGenealogist website is now available at www.genealogysupplies.com/email_news.htm. There's news of the new DNA service, some London parish records transcripts and directories, and more. The one item that particularly took my interest though was the last item, on a newspaper called the Channel Isles Monthly Review. The title helped to keep many ex-residents of the Channel Islands up to date with births, marriages and deaths, and other stories, during the German occupation of the Channel Islands in the Second World War. The site has copies of several editions from November 1941 to May 1945, hosted within its newspapers section, and hopes to place more online in due course. Sounds like quite a useful wartime resource. This is a slightly belated announcement, but I have just noticed that the source listings page for the Irish Genealogy website (www.irishgenealogy.ie) was updated last month on June 8th. This is the fabulously brilliant website from the Irish Government's Department of Arts, Heritage and the Gaeltacht which offers completely free to access digitised images and indexes for church records from Dublin City, Carlow, Cork and Ross, and Kerry (with some Monaghan records to come in due course). I am not sure what the update included, but if you have checked the site's source listings before and did not find what you were looking for, it may be worth another quick look! The source page is available at http://irishgenealogy.ie/record_list.html. FindmyPast has just released 150,000 parish marriage records for Devon. Full details are available at www.findmypast.co.uk/content/news/devon-july12, including a list of parishes represented, though not the years of coverage for each. The whole collection is described as containing records from 1837-2002, and has been sourced from Devon FHS. William Lilly, an astrologer, kept practice books listing his clients, their questions and the figures or horoscopes that he cast. Their questions relate to stolen property, probable success in any undertaking, ships at sea, health, long-life, love, marriage, pregnancy, &c. The books came into the possession of Elias Ashmole, who bequeathed them to Oxford University. This calendar was prepared by William Henry Black and printed in 1845. He lists the clients by folio number, remarking 'the names are often omitted, and usually written invertedly, or disguised in some other manner'. Where a date of birth is specified in the practice book, it is given in the calendar. Practice Book II is for consultations from 22 September 1645 to 17 August 1646. 'An Act for the more easy and speedy Recovery of Small Debts within the Borough of Derby, and the Liberties thereof', 6 Geo. III c. 20, appointed 120 initial commissioners to hear and determine cases as a court of justice to be called 'The Court of Requests for the Town and Borough of Derby, and the Liberties thereof'. A loyal address, 18 October 1775, from the Mayor, Sheriff, Aldermen, Common Council-men and inhabitants of the town and county of Haverfordwest, condemning rebellion in the American Colonies, and expressing wholehearted loyalty to Crown and Parliament, was presented to king George III, 14 November 1775, 'Which Address His Majesty was pleased to receive very graciously.' 'Let those wicked Persons, who from hence either secretly abet, or in America openly support, this destructive Contest, be taught some Truths, of which it is material that they and their misguided Followers should no longer be ignorant.' A similar address was presented at the same time from the Steward, Bailiffs and principal inhabitants of the ancient borough of Cirencester condemning 'so ill-founded and so unnatural a Rebellion'. Both addresses are subscribed by lists of inhabitants. '1. Representation - the happiest discovery of political wisdom - is the vital principle of the English Constitution, inasmuch as it is that alone, which in a state, too extensive for personal legislation, constitutes political liberty. '2. Political Liberty being a common right, representation co-extensive with direct taxation, ought, with all practicable equality, to be fairly and honestly distributed throughout the community, the facility of which cannot be denied. This list of subscribers gives full names, with the town of residence. Those subscribers who paid three guineas a year have a dagger in front of their names. 'An Act to appoint additional Commissioners for executing the Acts for granting a Land Tax and other Rates and Taxes', 11 & 12 Vic. c. 62, 14 August 1848, lists the new commissioners county by county and borough by borough, giving full name, with addresses in italics. Where part of a county lay, for taxation purposes, within a borough &c., the list of new commissioners for the rural portion is headed 'For the Rest of the County of ...'. The monthly Missionary Magazine and Chronicle listed contributions to the London Missionary Society received from individuals and through the auxiliaries. The issues for 1850 covered contributions received from 1 November 1849 to 31 October 1850. There are returns from Albany Chapel, Camberwell; Albion Chapel; Barbican; Barnsbury Chapel, Islington; Broad Street; Buckingham Chapel, Pimlico; Camberwell; Clapham; Claremont Chapel; Coverdale Chapel, Limehouse; Craven Chapel; Ebenezer Chapel, Bermondsey; Falcon Square; Fetter Lane; Finsbury; Hanover Chapel, Peckham; Hare Court; Haverstock Hill; Holloway; Holywell Mount; Hoxton; Islington Chapel; Jamaica Row; Kensington; Kingsland; Latimer Chapel; Lower Street, Islington; Maberly Chapel; Mile End New Town; New Court, Carey Street; Old Gravel Pit, Homerton; Orange Street; Paddington Chapel; Poultry Chapel; Queen Street, Ratcliffe; Robert Street, Grosvenor Square; Spa Fields; Stepney; St John's Chapel, Walworth; Stockwell; St Thomas's Square, Hackney; Surrey Chapel; Tabernacle; Tottenham Court Road; Trevor Chapel; Trinity Chapel, Brixton; Trinity Chapel, Poplar; Union Chapel, Islington; Union Street, Southwark; Walthamstow; Walworth; York Road; and York Street, Walworth. The East India Register and Army List was compiled, by permission of the East India Company, from the official returns received at the East India House. The list of civil servants in Bengal presidency is arranged by class of rank, and then by seniority of appointment. The season of appointment is given on the left, then name (usually in the form christian name, initials for middle names, surname) and current position, or if on furlough - except in the case of the appointees of the season of 1856 in the sixth class, where no position is stated, and christian names are given only as initials. Unlock the Past announces the 3rd Unlock the Past History & Genealogy Cruise. This will be a relaxing 9 night cruise to the South Pacific, combined with a fascinating history and genealogy themed conference. COMMENT: My wife, kids and I had a lot of fun on the last cruise down under - very highly recommended! I've now had confirmation from several readers in both the UK and Australia that it is possible to purchase the American based FindmyPast (www.findmypast.com) Pioneer subscription from outside of the US, though this offer is for a limited period only. The offer is for a 75% discount on the normal price - meaning access is just $4.95 a month. In proper money that means an annual subscription will cost just approximately £37.85 for a year's access to the holdings of FindmyPast US, FindmyPast UK, FindmyPast Ireland and FindmyPast Australasia. Learn how to register as a reader, find your way around the Library, request material and find out about our other services. The workshop also includes a tour of the Reading Rooms. If you are planning to register to use the Library after the workshop, please bring evidence of identity such as a current driving licence or a recent utility bill. Ever been interested in researching your roots, but unsure of where to start? Find out what resources the Library holds to help you with your family history research. The workshop also includes some practical information on how to become a reader. This workshop provides a basic introduction to Credo Reference and Oxford Reference online. Learn how to access hundreds of quality reference books online. Book online at https://auth.nls.uk/events/ or call 0131 623 3918. COMMENT: I'd personally consider it a real breakthrough if the Northern Irish executive could come up with a single exam that looked at the merits of both traditions, instead of continuing to polarise the subjects for the next generation. FindmyPast (www.findmypast.co.uk) has published two new sets of WWI records: Oldham Employers' Roll of Honour 1914-1920 and Oldham Pals 1914-1920. The records contain information on some 1900 soldiers. TheGenealogist website (www.thegenealogist.co.uk) has a new DNA page on its site, with the vendor offering tests provided by FamilyTree DNA (www.familytreedna.com). Mitochondrial DNA and Y-DNA tests are each available from £64.95, and autosomal tests from £217.95. For further details visit www.thegenealogist.co.uk/dna/index.php. The site offers details on the individual tests, but does not really explain the science behind DNA testing, so you may need to visit the FamilyTree DNA site for some additional background info to help explain it all! UPDATE: TheGenealogist now has an article online at www.thegenealogist.co.uk/featuredarticles/jul12_dna_testing.php explaining what it is all about to some extent, though a key point still missing is that your test's results are only of use when matched against someone else's results to see how close or not a match might be. The National Archives in England has announced the release of hundreds of images online from the Colonial Office Photographic Collection, depicting life in the Americas, and sourced from CO1069. The collection is accessible at http://nationalarchives.gov.uk/americas/ and includes some of the earliest images of Canada from the 1850s. RTÉ, the state broadcaster for the Republic of Ireland, has a new archives website online at www.rte.ie/archives/. RTÉ Archives contain a unique record of Irish life and we have created exhibitions where you can look at and listen to content from our collections. Andrew Chapman (@geneally) has been in touch to say that he has contacted the English and Welsh GRO at Southport to ask what developments may be happening in terms of digitisation of records, in lieu of the announcements made on this blog recently concerning the forthcoming intention to place historic Northern Irish birth, marriage and death records online next year (see http://britishgenes.blogspot.co.uk/2012/06/gro-northern-ireland-to-set-up.html and http://britishgenes.blogspot.co.uk/2012/06/more-on-new-groni-records-website.html). An Identity and Passport Service spokesperson said: "Digitisation and indexing of civil registration records in England and Wales was partially completed by 2010. Completing the process would require significant investment and there are no current plans to resume this work. IPS will continue to monitor the scope for future opportunities to digitise all Birth, Death and Marriage records." So, err, nothing to look forward to. Keep an eye out for next month's Family Tree magazine (http://family-tree.co.uk), where I explore exactly what is happening across the UK just now with regards to access to civil registration records. Suffice to say, England and Wales are definitely coming off worse, and not just with online access - it's the new north/south divide. The latest LostCousins newsletter is now available at www.lostcousins.com/newsletters/jul12news.htm. The latest updates from Peter Calver include news on forthcoming military records rumoured to be appearing on Ancestry, news on Welsh photographs online, the new Family Search site, further info on falling certificate sales from the English and Welsh GRO, and much more. This is brilliant - a series of War of Independence witness statements from Limerick and Tipperary, as recorded by the Bureau of Military History, are now accessible online via an interactive map at https://maps.google.com/maps/ms?msid=209706673428645354290.0004a9b164467968d5ff0&msa=0&ll=52.706347,-7.756348&spn=2.692679,4.938354. My wife's grandfather's family was resident on New Street in Carrick-on-Suir at the time, and I've just found a statement from a John O'Keefe resident there - lots still to explore! The Internet Archive now hosts 831 Scottish post office directories on its website at http://archive.org/details/nationallibraryofscotland, a vast increase on the number available on the National Library of Scotland's own portal at http://digital.nls.uk/directories/, where there are just over 700. There are, for example, now Glasgow based directories on the site up to 1919-1920, beyond the 1911 cut off point implemented by the NLS on its own site. "The UK site will be getting it's own World subscription in the early autumn. We are hard at work, fear not!" Due to present circumstances, the Scottish Catholic Archives are temporarily closed. We are putting measures in place to provide limited access by prior confirmed appointment to bone fide researchers each Thursday, commencing Thursday 26th July 2012. It may be possible to arrange additional access on another day per week by appointment. Please check this website regularly for any updates. Should you have any specific enquiries at the present time and for appointments please email archivists@scottishcatholicarchives.org.uk. "Exodus: Movement of the People" will take place from the 6th to 8th September 2013 at the Hinckley Island Hotel in Leicestershire. This major residential conference will give the genealogy community an opportunity to increase their knowledge on migration and network with other family historians. Full details of the programme will be announced in September. Alec Tritton, Chairman of the Halsted Trust says "We are delighted to once more bring a residential conference to the genealogy world. After the unparalleled success of our 2009 conference "Open the Door and Here are the People", the last International Conference for family historians, having findmypast.co.uk yet again as a major sponsor will help us deliver an outstanding conference at a reasonable cost to the general public with all the features delegates have come to expect from a residential conference. Debra Chatfield of findmypast.co.uk says "We are happy to take the opportunity to associate our brand once again with the Halsted Trust. The trustees have a proven track record in organising residential conferences and we are looking forward to a conference on migration. Findmypast.co.uk have many records relating to migration on our website as do our sister brands findmypast.com and findmypast.com.au. This conference is an excellent opportunity for genealogists to learn about the records of migration in a framework ideally suited for the purpose"
Shemot, the journal of the JGSGB (Jewish Genealogical Society of Great Britain), has won the coveted IAJGS annual award for Outstanding Publication by a Member Organization of IAJGS for the second time. The award was presented at the IAJGS Paris Conference Gala Dinner on Tuesday 17th July and accepted on behalf of JGSGB by Bernard Valman, the Editor of Shemot, who regards it as a tribute to the whole organisation which has supported it, but especially to the authors, proof readers and readers. The citation for the award reads: “Shemot, the outstanding journal of the Jewish Genealogical Society of Great Britain is published with a distinct theme three times each year. Each issue attracts contributors with expertise in the theme and provides articles with breadth and depth. The content of this relevant, informative and worthwhile journal reflects the skill set of a strong network of member and non-member contributors. Although the high-quality and original articles are primarily of interest to individuals researching British roots and those whose families trans-migrated through Great Britain, they are relevant to all researchers." Shemot, which means “Names” in Hebrew, owes its pre-eminence to its long-serving editorial team of Bernard Valman and Mike Gordon, not to mention its many interesting, informative and authoritative articles. Some recent themed issues have included Jewish genealogy in South Africa, the East End of London, and Leeds. Shemot was founded in 1992 and is circulated to all JGSGB members, as well as dozens of other Jewish genealogy societies and libraries including the New York Public Library. As Keeper of the Records of Scotland (1985-90) I was not only concerned with the national archives but also with the preservation and recording of records held by other institutions or individuals throughout Scotland. The Scottish Catholic Archives are of international, not just national significance and it is vital that they should be kept intact in the care of a qualified archivist and in a location where they are accessible and freely available to researchers, who are willing to travel from elsewhere in Britain and overseas to consult them. It is sad that the support given by the late Cardinals Gray and Winning to the then archivist Mark Dilworth is not being continued by their successors. Other signatories have included historian Domhnall Uilleam Stiubhart, Your Family History editor Nick Barratt, members of professional bodies AGRA and ASGRA, and many more. To sign the petition please visit www.change.org/en-GB/petitions/the-roman-catholic-church-in-scotland-keep-the-scottish-catholic-archives-in-edinburgh-2?utm_medium=email&utm_source=share_petition. A few days ago I blogged about the overseas FindmyPast websites in both the United States and Australasia having now implemented a single global subscription allowing access to the different sites in the US, the UK, Ireland, and Australia & New Zealand. A UK based reader, Cathy, has since posted comments following the blog post at http://britishgenes.blogspot.co.uk/2012/07/all-new-findmypast-in-beta.html, in which she claims to have been able to sign up to the American site's new Pioneer subscription from here in the UK - meaning that she now has an annual subscription to the worldwide based records of FindmyPast for less than £40 a year. NB: The Australasian site at www.findmypast.com.au is not offering the Pioneer subscription, just a 10% discount. UPDATE: Because the Search filters are very different on the UK site compared to the US site, it is difficult to do a comparison with searches between the two. However, on the US site, I just did a search for a William Paton between 1880 and 1900 and obtained 68 results under "Births & Baptism" and using the "United Kingdom" filter. The interesting thing is that although most of entries in the list are from the English and Welsh national GRO registers, a small handful, including the first, are in fact from a collection called Derbyshire Registrar's Birth index. The index reference give is GB/G01/037, not a year and quarter as with national records. I was not aware that this collection was on the UK site? I don't think I'd have found these on the current UK site if it hadn't been for the new version of the site in the US! MyHeritage genealogical data subscription now available at 46% discount via the free Federation of Family History Societies (FFHS) ezine. To celebrate the launch of SuperSearch, MyHeritage and the Federation of Family History Societies (FFHS) are delighted to announce a special offer of a 46% discount on a global MyHeritage data subscription. This subscription provides access to more than 4 billion historical records via MyHeritage SuperSearch, the new and most advanced genealogical search engine. This massive discount is being made available to any reader of the latest free FFHS ezine by going to www.ffhs.org.uk/ezine/ezine1207.htm#offer where full details are available. Alternatively you can try SuperSearch by purchasing a package of data credits at a special discount price. The seminar will be followed by an afternoon of one on one genealogy consultation with Craig Foster. Prior booking is essential. The National Library of Scotland (www.nls.gov.uk) has been awarded £100,000 to establish a new National Sound Archive in partnership with the Tobar an Dualchais / Kist o' Riches project based on the Isle of Skye (www.tobarandualchais.co.uk). At a time when the position of Scotland in the Union is the subject of renewed debate, this podcast reminds us of the outright hostility that underlay the relationship of England and her northern neighbour during much of the medieval period. Next year’s 500th anniversary of the Battle of Flodden and the recent publication of a new book of essays on this subject provide a useful opportunity to show how the records at The National Archives illuminate why and how England and Scotland spent so much time at war between 1296 and 1513. The talk is available at http://media.nationalarchives.gov.uk/index.php/england-and-scotland-at-war-1296-1513-sources-at-the-national-archives/ or from iTunes. Incidentally, as well as Flodden's 500th anniversary next year, today sees us just 700 days away from the 700th anniversary of the Battle of Bannockburn, when Edward's army was "sent homewards to think again". A new website has been launched at www.battleofbannockburn.com counting down to the anniversary and providing information on the new visitor centre. The stories that make the history of Scotland’s number one paid for visitor attraction so fascinating have been re-written following consultation with archaeologists, historians and other experts to create a new interpretation at Edinburgh Castle. Colourful and dramatic illustrations reconstructing some of the tempestuous events that helped shape the nation’s history have been installed at the site, following months of meticulous research by Historic Scotland. More than 30 specialists within and outside the agency contributed their expertise to the project. Huge amounts of written material and images were also studied, to produce an unparalleled resource that will bring the story of the Castle to life for the hundreds of thousands of people who visit the Castle. Director of Commercial and Tourism at Historic Scotland, Stephen Duncan explained: “The new interpretation offer a surprising amount of detail. In some cases, the content might alter preconceptions, often contradicting popular myths. As well as the broad range of scholarship within Historic Scotland, staff from the National Museums of Scotland, Glasgow Museums, the universities of Edinburgh, Dundee, Glasgow and St Andrews, and the Royal Artillery Museum were among those who helped create the new interpretation. · The arrival of the Romans, showing how the hill fort that predated the Castle would have been an important centre for diplomacy. · A 12th century precursor to today’s parliament, with an assembly of nobles and clergy at the Castle, called by King David I. · The firing of Castle’s guns on Edinburgh by its Redcoat garrison, when the Old Town was occupied by the Jacobites in 1745. 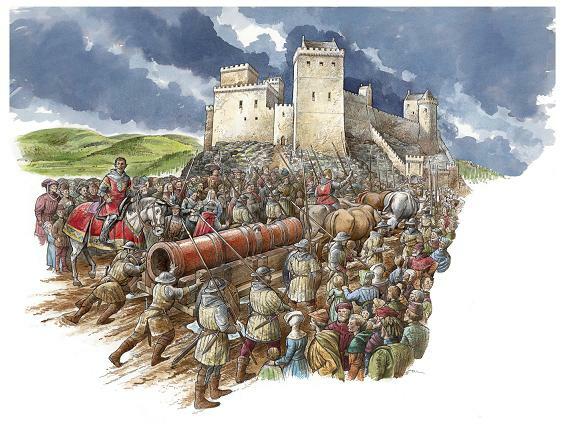 · The recapture of the Castle by the army of Robert the Bruce, in a night attack in 1314. · The arrival of giant cannon Mons Meg in 1457, when its now-famous barrel was painted lead red. Seven new panorama illustrations showing views of Edinburgh have also been installed at the Castle. These pick out key features in the spectacular landscape and skyline. Two show the New Town under construction in the late 18th century when many familiar landmarks were being built – and many others had yet to be conceived. The very first version of the UKBMD web site simply provided a map of the UK and linked the counties to their respective Local BMD web sites if they had one. This first version was soon replaced by one similar in style to the current version, with links to all sorts of other websites with on-line data for a wide range of categories. However, we often still see many references to UKBMD which only mention Civil Registration. Selecting a county from the drop-down list in the menu will show a wide range of links to sites with more than just civil registration data. Two of the major categories are Census and Parish Register data. To highlight this fact the menu on the left of the UKBMD pages has been enhanced to add another button for Parish Registers. Click on this button and all the sites that we know of with on-line parish register data will be listed. At the top of the list will be a drop-down list of counties which will allow you to refine the list to show only sites for a chosen county. In a similar manner, the Census page has been enhanced also to allow you to refine the list based on a selected county. Seventy years ago today the extermination of Polish Jews in the Warsaw Ghetto commenced, when 6000 Jews were taken by rail to Treblinska to be gassed. They had been conned into believing that they were to be relocated to labour camps, and with offers of free food. The BBC has the story at www.bbc.co.uk/news/magazine-18924842, focussing on the story of one individual, Janina Dawidowicz, who managed to survive. A petition created by Fife based genealogist Janet Bishop is now online asking the Roman Catholic Church in Scotland to keep its resources centralised in Edinburgh and in the care of a dedicated archivist, rather than to have it dispersed across the country. UPDATE: In less then 24 hours, the initial target of a hundred signatures has already been reached. Thanks to all, but please spread the word to help get it to 200! Dublin based vendor Eneclann (www.eneclann.ie) has been awarded a contract by the Irish Government's Defence Department to computerise the Military Pension Service Project. This will, in the first instance, seek to make available online a finding aid to pension and medal records relating to the original Irish Republican Army and associated bodies such as the Irish Citizen Army and Cumann na mBan, which fought to remove Ireland from the United Kingdom (which it had been a member of since 1801). Following Partition in 1921, when dominion status was granted to the 26 counties forming the Irish Free State (but not to the north, which rejoined the UK as 'Northern Ireland'), the old IRA basically split. Over half of the army was reconstituted to form the Free State Army, the Irish Free State's first military force, whilst the rest refused to accept the Treaty provisions and became known as the Irregulars, ultimately taking the country to a tragic civil war which they subsequently lost. The thirty month project commences in August, with results due to be placed eventually online at Military Archives website (www.militaryarchives.ie) in time for the centenary of the Easter Rising, in 2016. Further records will also be processed in due course. Charities have been operating in many forms for nearly 800 years. They were at their most important in Victorian England where in some places they rivalled the poor law in providing for the unfortunate. This podcast explores the history of charities and the records you can use to research ancestors who either sought their aid or who helped to run them. To access the podcast visit http://media.nationalarchives.gov.uk/index.php/charities-and-their-records-for-family-historians/ or download from iTunes. Note - the first few minutes of the talk are in fact missing, due to technical problems with the recording apparently. FindmyPast (www.findmypast.co.uk) has added 8,163 new Chester wills and probate records to its Cheshire collection, covering the period from 1711-1772. It’s official! After a trial period of a few weeks, the new emigrant website www.hebridespeople.com was formally opened on Friday 20th June 2012 at Seallam! Visitor Centre in Northton, Isle of Harris, by George MacKenzie, Registrar General and Keeper of the Records of Scotland. As well as much other information on the Outer Hebrides and their history, the website now includes a searchable database with information on over 22,000 emigrants who left the Outer Hebrides between 1780 and 1920. The information is drawn from the records gathered over fifty and more years by Bill Lawson, who is internationally known as the genealogist of the Outer Hebrides area. In addition to his comprehensive database of all island families, he has researched the census and other records in the main emigration areas, to identify families there of island origins. For emigrants before the 1820s, the database information is often incomplete, reflecting the limitations of the source material at that period, but after 1820 it generally has information on spouse, parents, village of origin in the Outer Hebrides, destination overseas, date of emigration (often approximate) and on occasion the name of the emigration ship. There are also cases where it is known that families left the Outer Hebrides, but their destination is not currently known – though since new information is constantly becoming available, fuller details may be available in the next version of the database! Although the database is primarily aimed at the overseas descendants seeking to find their family’s origin, it will also be helpful for UK researchers trying to find where emigrant relatives settled. The website works on the system of purchasing and using credits, which is similar to that which will already be familiar to researchers on the scotlandspeople web-site. All income from the site goes to the maintenance of the resource and further development of the site, which it is hoped will eventually provide information on a quarter of a million persons from all over the Outer Hebrides! Comedian John Bishop has just tweeted the following - "In Portsmouth filming Who Do You Think You Are and I am on Nelson's ship Victory sitting where he placed his column " (he's sitting on the loo!) - John Bishop's Twitter account is found at @JohnBishop100 - and he has a pic of said seated position at https://twitter.com/JohnBishop100/status/226585176145285120/photo/1 ! "On the way home after tracing my family tree in Portsmouth - apparently Mario Barotelli is more Scouse than I am!" "Yes I am in the next series of Who Do You Think You Are - cant give out clues but it was a great experience with some big surprises." Serious news for those interested in Indian research - the Gulf state of Qatar is sponsoring the digitisation of half a million British Library based India Office records in a new three year project that will eventually see the records made available online for free. The full story is at www.guardian.co.uk/books/2012/jul/18/british-library-india-office-qatar. This is a separate project to the deal previously announced last year between the British Library and Brightsolid to digitise much of the India Office collection's parish register holdings (see http://scottishancestry.blogspot.co.uk/2011/03/india-office-records-and-uk-electoral.html). Irish Roots magazine is offering a free digital copy of its March issue - but only until Monday 23rd July. To download the magazine visit www.magcloud.com/browse/issue/373636. The National Archives of Ireland catalogue works! Annie Lennox to appear in WDYTYA?